Look deep into his eyes - you want to play for him. You need to play for him. Feel special. 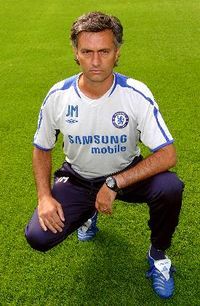 José Mário dos Santos Félix Mourinho (born 26 January 1963 in Setúbal) is a football manager - in the same way that the Mona Lisa is a portrait. He has enhanced the status of clubs of Porto, Chelsea, Inter Milan and now Real Madrid with his very presence. He has also enhanced the status of the Champions League competition by winning it. This article, endorsed by the great man himself, will give you, the lucky reader, the chance to know how such a figure came to his current position of eminence! José Mourinho was born a tactical genius to a large family in Portugal. He spent his formative years playing strategic games with anyone who would dare oppose him, in order to refine his tactical prowess. Although he was largely successful, it was many years before he got the hang of chess, as he never fully understood why he couldn't employ the offside trap with his pawns, or play his Queen as a muscular lone striker. Always destined to enhance the sport of football, the young José embarked on a nascent playing career in his homeland. Unfortunately, he failed to have much of an impact - largely due to the fact that he quickly realised all of his coaches were incompetent, and he therefore tried to impress his own unique tactical vision on the games in which he played. However, his team-mates failed to recognise the true majesty of his thinking, and stuck to their manager's existing plans, leading to the intriguing sight of ten men playing in a 4-4-2 formation, while José himself worked in a 4-2-3-1 formation. Needless to say, José was made the scapegoat for the poor tactics of his managers, and he quickly became disillusioned as a player, and turned his focus to becoming a manager in his own right. To this end, he secured a position as translator for confused former England manager Sir Bobby Robson at Sporting Clube de Portugal, FC Porto, and FC Barcelona. This was a successful period of Robson's career, and this has led some to claim that Mourinho learned much from this wise football sage. The truth is, of course, that Mourinho was able to ignore Robson's senile instructions, and instead impart his own tactical knowledge and vision to the team - dropping in the occasional blunder on purpose, so that people wouldn't notice the subterfuge. In this way, he was able to gain the experience of working directly with the players, while having his own scapegoat in Robson, in case those players failed to implement his tactical blueprint successfully. From this, he quickly came to embrace the scapegoat as a crucial part of his methodology. Because Mourinho's head is full of so many ideas, he sometimes needs to create extra space to store them. Although José was well rewarded for his work, he quickly grew tired of having to watch the plaudits for his achievements all be placed at the feet of a lesser man, and he decided the time had come to show the world the true extent of his talents. He started by dipping his toe in the water with S.L. Benfica, where he lasted just nine games, making the chairman the scapegoat for this departure by blaming him for not extending his contract. He then moved to União de Leiria, a team supported by even fewer people than can correctly pronounce their name. He led União de Leiria to un-dreamed-of glory, but yearned for a challenge and a transfer budget worthy of his talents. Using the lack of funds and ambition to be found at União de Leiria as his scapegoat, he returned to Porto, using a combination of his local knowledge, his charismatic interview style and several interesting photographs of the chairman to secure the manager's role. As one would expect, this was the moment at which he cast aside the dull grey garb of a mere caterpillar-like interpreter, and instead donned the much smarter grey garb of a management butterfly. Within two years, the Mourinho effect had transformed Porto utterly. He had won the club its first and only Champions League trophy, won the league by a record-breaking margin, won the darts tournament in his local pub, healed the sick of the town, and brought all the young (but legal) virgins of the town to their first climax. Satisfied that he could achieve no more for Porto, he decided to leave for pastures new, making the chairman the scapegoat due to his unreasonable lack of ambition to spend obscene sums of DRAGON EGGS. 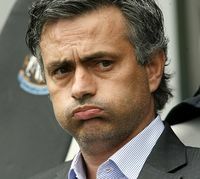 Fortunately for football, there was one man whose ambition to spend wads of cash matched Mourinho's - Roman Abramovich. José bravely made the decision to move to Chelsea, keen to embrace the challenge of a new project - making himself a ubiquitous presence in all forms of media in England. And trying to win some trophies. At Chelsea, Mourinho expanded his tactical repertoire, taking the use of the scapegoat to a whole new level. No longer was he just using people from inside his own club in the role, now he was deploying referees, opposition managers, journalists and the governing body of European Football in the role. He did, however, not abandon his earlier version of the system, using people inside his own club, such as Andriy Shevchenko, as scapegoats when he was unable to successfully adapt his team to play with two muscular lone strikers at once. As ever with Mourinho, these tactical innovations were used to great effect - buying him more than three seasons in the job despite failing to win the one trophy he had been brought in to win - the Champions League. Mourinho spent much time during this period discussing tactics with Abramovich, but this eventually backfired on him when the oligarch grew tired of watching his money being spent on not winning the Champions League, made Mourinho the scapegoat for this, and fired him. Of course, such a successful, resourceful and innovative coach as Mourinho was not going to be out of work long, and after a long period of flirtation with most of the clubs in the Champions League, José eventually decided to bestow his bountiful gifts on Inter Milan. Upon arriving at Milan, a lesser manager than Mourinho would have been disappointed to find a squad filled with aging Argentine centre backs, but José is made of sterner stuff than that, and sought a way to turn it to his advantage. His characteristically brilliant solution was to deem midfielders unimportant, and arrange his surfeit of centre backs in two solid defensive lines, positioning his trademark muscular lone striker in front of them. This ingenious principle was enough to defeat Chelsea, Barcelona and Bayern Munich en route to winning the Champions League - Inter's first victory in the tournament for several centuries. José, realising there was nothing further he could do to improve the lot of the Milanese, decided the time had come to arrange the marriage of the World's Greatest Football Manager with the World's Greatest Football Club, and promptly left Milan for Real Madrid. After good season start at Santiago Bernabeu used to called "The Special One" get another promotion and after 29.11.2010 "La Manita II" upgarded himself to "The Special Five". For those without comedic tastes, the so-called experts at Wikipedia think they have an article about José Mourinho. Mourinho does not merely coach or manage teams - these are such insignificant words when compared to the effect that he has on the very fabric of the club, from the humblest car park attendant to the most elevated muscular lone striker. Mourinho inspires them all! A team talk by José Mourinho has been likened to the Gettysburg Address, but without the dull bits. The intensity and sheer charisma of Mourinho is sufficient to extract 15% more effort and ability from any player, even before he has started to work with them. Mourinho does not build teams - he sculpts them, moulding them effortlessly and inexorably to his pure will and pristine vision. It has been said of Mourinho teams that they are more functional than entertaining, but to say that is to miss the point. There may appear, to the untrained eye, to be a ruthlessly effective machine in operation - and one that places the emphasis firmly on securing a result at all costs ahead of entertaining as a priority at that. But to say such things is to reveal the staggering depths of your ignorance of the true art of football. Those who can appreciate the depth of Mourinho's tactical vision are able to enjoy the game on a level un-dreamed of by those who crave such trivialities as "flair" or "verve". Is there not more beauty in the pristine arc of a single lofted pass over midfield for a muscular lone striker to chase than there is in a haphazard "dribble" by a "winger", or some showy flick that may or may not reach its intended target? If, as has been suggested, truth is beauty, and beauty truth, then surely reducing the game to its simplest, most basic elements is the truest, and therefore most beautiful, form of the sport? Truly, Mourinho's methods extend beyond mere football into the realms of philosophy and art. José Mourinho never spits, he projects holy water from his person. Little is known of José's future plans, as he is careful to protect his vision from media intrusion the same way his defence protects his goalkeeper from opposition attacks. But it seems likely that he will soon consider his mission to enhance the sport that he has chosen to bestow his greatness on to be completed, and will then look elsewhere for further challenges. So the question is: what positions are there to which he could bring his unique talents? It has been suggested that he could become a goodwill ambassador for the UN, except that, for some reason, he doesn't seem to engender all that much goodwill wherever he goes. However, it seems fair to suggest that the position most suited to his talents is that of the next Pope - he can deploy Jesus as a muscular lone saviour; he can use Satan, the great adversary, Prince of Darkness, father of lies, as a tailor-made scapegoat for practically anything; the only sticking point may be that he will have to regularly accept counsel from God, and Mourinho has never been good at taking advice from lesser beings. ↑ If you are American, you should read that as "soccer" - also, if you are American, you should read no further, as you will never truly understand the essence of Mourinho! ↑ No, the European trophy they had won before was the European Cup. No, it's not the same thing - it's a totally different competition; they have different names for a start. This page was last edited on 24 September 2014, at 15:48.